The Chiastic Structure of the Hobbit | Theopolis Institute | Bible. Liturgy. Culture. Structure plays an important part of any literary work, whether poetry or prose. It adds to the beauty and depth of the work and allows insight to be gained about what the author is trying to communicate. The question that concerns us here is whether or not there exists an underlying structure in J. R. R. Tolkien’s The Hobbit. I will contend that such a structure does exist in the form of a chiastic design. Chiastic structuring is a common device used throughout Biblical literature as well as in classical Greek and Latin works and even in Old English epic poetry. We will proceed section by section to point out the parallels that exist between corresponding members. The A/A’ sections share the simple fact that Bilbo is home, but in addition, Bilbo comes into possession of treasure at the beginning and end of the book. There is the encounter with the trolls at the beginning of the book and at the end he travels past the same trolls having been petrified by Gandalf’s cleverness in keeping them out until morning. Lastly, there are the two accounts of Gandalf and dwarf-company showing up unannounced. This last visit is only with a single dwarf, Balin. In the B/B’ sections there is the contrast between the relative amicability between the dwarves and elves in Rivendell and the confrontation, towards the close of the book, between the dwarves and elves, which nevertheless ends in an alliance. Here, too, in these sections Bilbo and company encounter goblins in a storm and during each encounter Bilbo gets knocked out. These details are the only places in the book where we have goblins showing up in a storm with Bilbo getting knocked out in each instance, thus strengthening their connection as parallel members. Chapters V and VI together with chapters XII, XIII, and XIV, the C and C’ sections, respectively, provide us with perhaps the strongest parallels. In both passages Bilbo meets a villainous creature with long life, in Gollum’s case, a prolonged life. 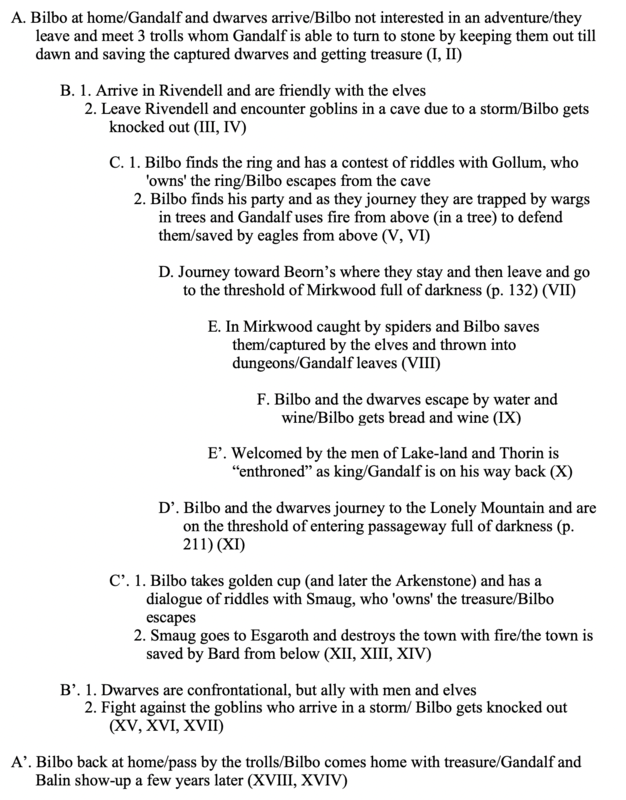 In each of these corresponding sections there is a contest of riddles between Bilbo and the villainous creature. Both are set in the deep dark with Bilbo coming into possession of a treasure of incomparable value. In Bilbo’s confrontation with Smaug, he finds the Arkenstone, of the “precious things” Smaug was hoarding. The only “precious” thing Gollum possessed was the One Ring and here I think we have a clue to the real value of the ring due to it being set in parallel to the vast treasure of Smaug, which includes the Arkenstone. It seems to be nothing more than a valuable trinket except for this parallel. In both instances Bilbo is able to escape without harm. In these two sections we also have a contrast. After Bilbo makes his escape from the cave and is reunited with the company of dwarves, they are trapped by wargs in trees and they, in order to defend themselves, rain fire down upon the wargs from the treetops. They put up a defense long enough for the eagles to come and rescue them. The C’ section has an inverted version of this. Smaug leaves the mountain and begins to reign down fire upon the town of Dale and it is those below who have to protect themselves. Salvation comes not from above as with the eagles, but from below when Bard lets loose his arrow with it finding its mark in the one penetrable spot on Smaug and he is defeated, thus saving the town from destruction. Chapters VII and XI (D and D’) have the similarity of a journey. In chapter VII the journey is to Beorn’s and in chapter XI the journey is to the Lonely Mountain. In addition, common to both chapters is the approach to a threshold. Both of these thresholds are described as being dark, foreboding, and dangerous. Yet, the company of hobbit and dwarf bravely cross over these thresholds pushing their journey into the darkness. In the E and E’ chapters we also have a number of significant contrasts. After the companions are caught by the spiders and rescued by Bilbo, they are subsequently caught by the elves and cast into the dungeons. Bilbo is able to evade this action by his use of the ring. In contrast to this cold reception by the elves in chapter VIII, we have in chapter X, the opposite reception by the men of Lake-town. They are greeted with joy and feasting and Thorin is hailed as the king returned. There is a transition from the depths in the dungeons to the heights of a royal reception. Additionally, it is in chapter VIII that Gandalf takes his leave of the fellowship and goes off on his side mission to engage the Necromancer. In chapter X, we are told that Gandalf is on his way back having finished his “other business,” though he does not actually arrive until later. The center of the structure of The Hobbit is chapter IX, section F in my chiasm. It is here that the whole of the story hinges and makes its turn. It is in this section that Bilbo orchestrates the escape of himself and the dwarves by means of water and food barrels. Salvation by means of the water that flows under part of the Elven king’s castle, especially when in the context of the working of an invisible agent to liberate twelve dwarves from captivity is full of biblical, sacramental imagery. The dwarves go through a baptism of sorts. Furthermore, with the utilization of the food barrels and the heavy emphasis on wine (in fact, the word “wine” occurs only at the beginning, end, and middle of the book) barrels in the chapter, there is likewise a heavy eucharistic theme in this chapter, once again coupled with the working of an invisible agent to bring about their salvation. This too makes the transition from dungeon and ‘enthronement’ more understandable. The dwarves go through a sort of symbolic death and resurrection with the transition being one of passing through water in a barrel, which very well could be taken as an ark (an arken-barrel!). 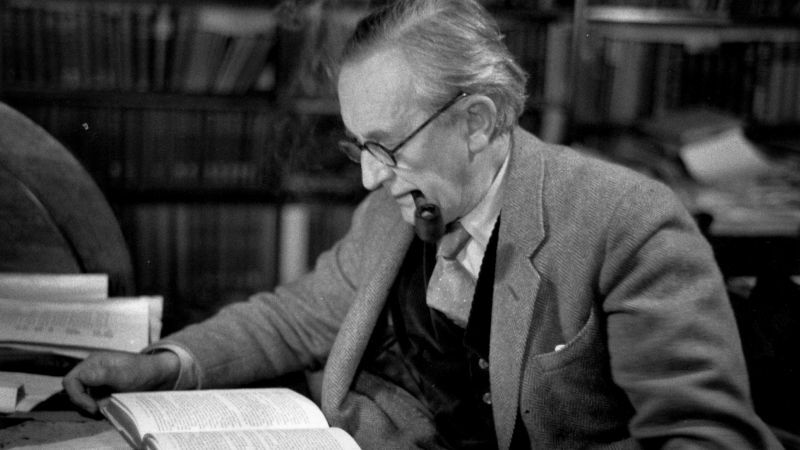 The payoff for using such a literary technique is that Tolkien is able to tell a story within the story. On the surface there is the straightforward linear development of the plot as a satisfying story in its own right involving a hobbit who goes on an adventure with a group of dwarves and lives to return home and recount the marvelous tale with its climatic moment at the end occurring with the death of Smaug and the great battle. At another level the story is a journey with a different climax that occurs in the middle where the hero goes from being one kind of person to becoming another kind of person through a process of reckoning with darkness and death, and moving through those to light and life through resurrection. What, though, prevents this scheme from being a mere contrivance, a clever utilization of words used to manipulate a certain outcome? Does other evidence exist supporting the likelihood of Tolkien’s use of a ring architecture? I believe such corroborating evidence does exist. And Jonah got up and went to Nineveh according to the word of Yahweh and Nineveh was a great city for God, a journey of three days. And Jonah began to enter into the city, journeying one day and he proclaimed and said, “In forty days Nineveh will be destroyed.” And the men of Nineveh believed in God and they proclaimed a fast and put on sackcloth from the greatest of them to the least of them. And the word reached the king of Nineveh and he got up from his throne and removed his robe from upon him and covered himself with sackcloth and sat in the dust. And he made a proclamation in Nineveh and said, “From the decree of the king and his nobles saying, ‘Let man and beast, cattle and flocks taste nothing. Let them not feed and let them not drink water. But let man and beast be covered with sackcloth and let them call out to God vehemently and let [each] man turn from his evil way and from the violence, which is in their hands.’ Who knows? God may turn and relent and turn from the anger of his nose and we may not perish.” And God saw their deeds that they turned from their evil ways and God relented from the evil which he said he would do to them and did not do it. The movement of the passage is from judgment to reprieve brought about by the repentance of the people and centrally the king, who exchanges his royal robes for sackcloth and descends from his throne into the dust (cf. Genesis 3:19) in a symbolic death. Nineveh’s fate is reversed after they turned from their evil ways and their violence. This is a single example of the kind of structuring Tolkien may very well have been aware of, but this evidence by itself needs buttressing particularly from works that he would have read and devoted a good deal of attention to in order to find further support that The Hobbit has a similar structural architecture that is not merely the figment of one’s imagination. Fortunately, such a work exists and exhibits the kind of structural architecture we are looking for, viz, a chiastic or ring design. 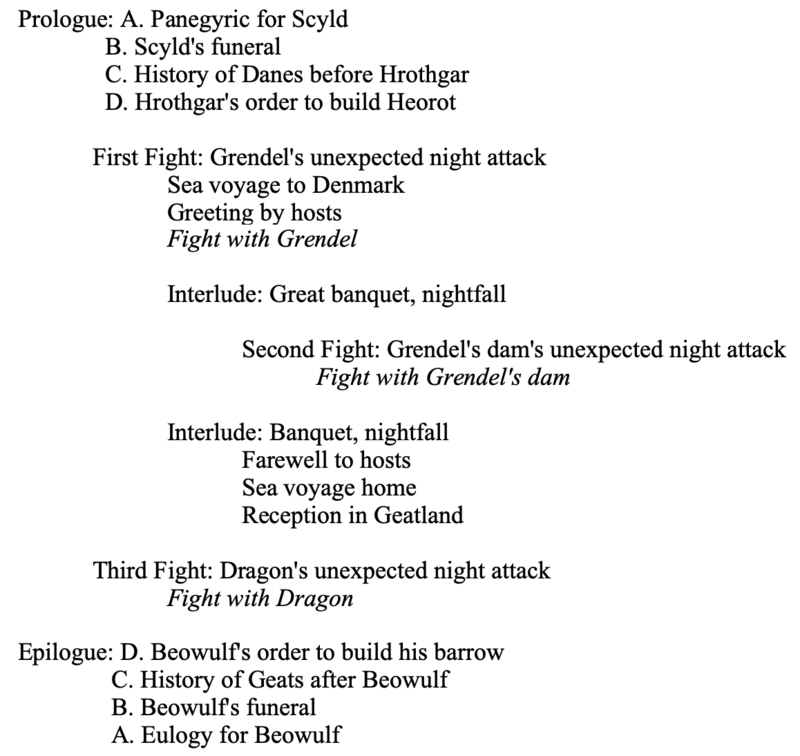 Thus, we have evidence from Tolkien himself that he gave attention to the structure of a literary work as a whole, in this case Beowulf, which as Niles has shown is composed as a ring. What makes this more important is that this recognition by Tolkien of the macro-structure of Beowulf predates his publication of The Hobbit. While we can never be sure what the exact structure was that Tolkien had in mind, the evidence is still compelling and is all the more so given the biblical proclivity toward chiastic structuring, which we saw utilized in a brief passage from the book of Jonah using Dorsey’s analysis. If Tolkien was interested in identifying macro-structures, then the Bible gave him ample opportunity to exercise his interest. Here the first encounter of Beren and Tinúviel is told in dramatic and beautiful verse made all the more lovely by its elegant structural parallels with each element balanced by another with the whole story turning on Beren’s relentless pursuit of the captivating beauty he had chanced upon. And the image of searching through a winter with his pursuit coming after the passing of winter and spring makes their embrace all the more profound. In conclusion, while we can never for certain know what Tolkien may have meant as the literary design of The Hobbit, it seems that a good case can be made from the text itself that an inverted structure exists within the book. This case is made even stronger by the use of such chiastic structures in the Bible and in the epic poem Beowulf. Both of these were pieces of literature that Tolkien would have been very familiar with, especially given his tantalizingly and maddeningly brief comments regarding the composition of Beowulf. It is important to note that in both the Jonah passage that we considered and in Beowulf, the center of each passage was some form of symbolic death and then resurrection. This is also the case for the center of The Hobbit. The existence of this structure only adds to the overall beauty and depth of this classic of literature and to the skill with which its author conceived of and crafted this masterpiece. 2. ↑ Humphrey Carpenter, J. R. R. Tolkien: A Biography (New York: Houghton Mifflin, 2000), 150. 3. ↑ It is not lost on me that Jonah was the book of the Old Testament that Tolkien translated for the Jerusalem Bible in 1966, which was done well after his work on The Hobbit. It serves here as an example of the kinds of structures that pervade the Scriptures, which so deeply informed Tolkien. The translation is my own. 4. ↑ David A. Dorsey, The Literary Structure of the Old Testament: A Commentary on Genesis—Malachi (Grand Rapids, Michigan: Baker Academic, 1999), 294. Underlining is Dorsey’s. 5. ↑ John D. Niles, “Ring Composition and the Structure of Beowulf,” PMLA94.5 (Oct. 1979), 924-935. 9. ↑ J. R. R. Tolkien, “Beowulf: The Monsters and the Critics” Christopher Tolkien, ed., The Monsters & the Critics and Other Essays(London: HarperCollins, 1997), 28. 10. ↑ J. R. R. Tolkien, “On Translating Beowulf” Christopher Tolkien, ed., The Monsters & the Critics and Other Essays (London: HarperCollins, 1997), 71.